A few months ago, someone posted about the Osmo that was ready for pre-order. I convinced my library’s Friends to purchase one and have been anxiously awaiting a chance to debut it in a program. (The Osmo is awesome, and I love it!) One of the reasons we bought it is so that we can use it at our annual math nights and literacy nights that we host for our local Title I elementary schools. There are three apps for the Osmo right now. One of the apps, Words, has kids competing or working together to spell words based on the picture on the screen. Luckily, right before our literacy night, the developers released an update that allowed users to create a custom word list. What better way to promote literacy and the library than with a customized library-themed word list? I spent an afternoon running around the library taking pictures to build the list, and I’m really happy with the results. 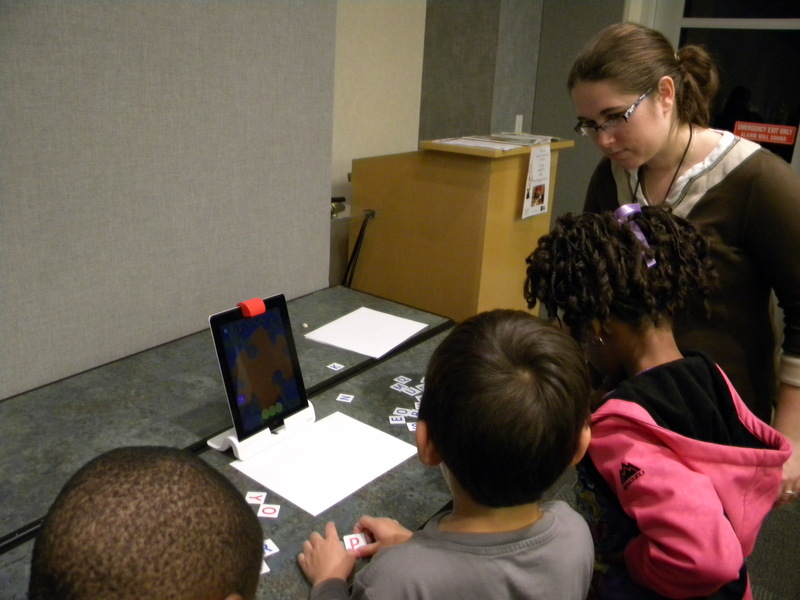 At the night of the program, I set up the Osmo station, just one iPad with two sets of letters and the Osmo. Kids had to take turns using the Osmo and could play two words in a row before they had to switch. If no one was waiting, they could keep playing. Some kids were really competitive, but it was really wonderful and heartwarming to see some of the older kids helping the younger ones spell the words. If a child hadn’t gotten a right letter in a while, some of the older ones would hand them a letter and show them what to do. I didn’t even have to say anything! While the kids were playing, I had a chance to speak (well, shout, really) with parents about screen time and what resources the library offers for them. The whole experience went so well that we’re bringing the iPad and Osmo back for Math Night in the spring, and the local teachers all want one for their classrooms. All in all, it was a huge success! Posted on October 31, 2014, in Apps and tagged Rachel Sharpe. Bookmark the permalink. Leave a comment.